Afternoon my sweets......gosh has a nice lie in with the cat this morning and hubs brought me a cuppa in...right whats he been up too lol!!! he never makes me a coffee.....but i sure enjoyed my lazy morning so i set to and finished a half made card this morning the image is from crafts and me and i just love her face and that hair i think is wonderful wish i had hair like hers....the image think was meant as a perhaps halloweeny ..as she has a ruddy big spider in her hair the webbed thing in her hair and of course a cat she was called vixy but i loved it so much i just had to finish her off i teamed her with greens not my fav colour but with flaming red hair and green eyes it seemed the obvious choice the papers are from a pad with no front cover so i think its papermania ? ?..flowers from wild orchid must get a few more hand done pins and a flash of lime ribbon with a double bow dark green chiffon..so there you have it coloured her with pro markers...how I'm loving colouring with them now i think i have the hang of the blending lol!!!!! So wonderful card, this image is so perfectly coloured ! Love the lace ! Fantastic card and amazing coloring! Love the color combo and background! WOW! this is stunning Sassy. The really is such a wonderful image and your colouring is fabulous. I love the layout and yummy detailing. I'm pleased you have had some time to relax today. Hi Sassy - STOP SHOUTING AT ME !!!! But I will forgive you because this is such a beautiful card. Your design and colours are stunning. Your image is brilliantly coloured and I love your scrummy details!! and thanks so much for joining us at Simon Says Stamp challenge. Oh wow what a wonderful card.. I totally love the colour. Promarkers do take a while to get used to. I think I will always be mastering the technique. Stunning image and coloring Sassy. Love the green, such a rich jewel tone. Fabulous card Sassy, I love the image the lace and the colours. Wow this is gorgeous Sassy!! Well, green is my fav colour so I absolutely adore this. Fabulously coloured (I would kill for those green eyes1) and your pins are gorgeous. I am so jealous of your lie in Sassy. I'm with you with the spider but the image is just gorgeous and the colours are just perfect! Wow, this is gorgeous Sassy. 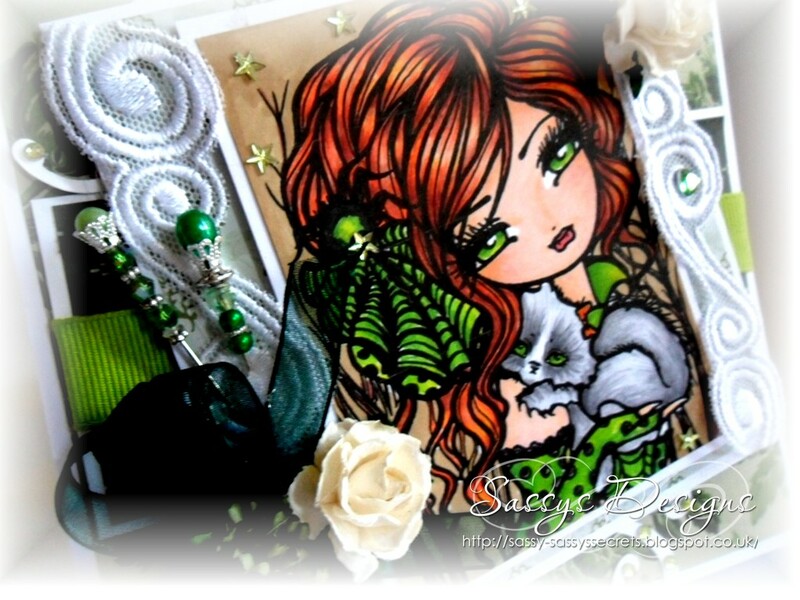 stunning card Sassy, love the rich colours - they look so dramatic! 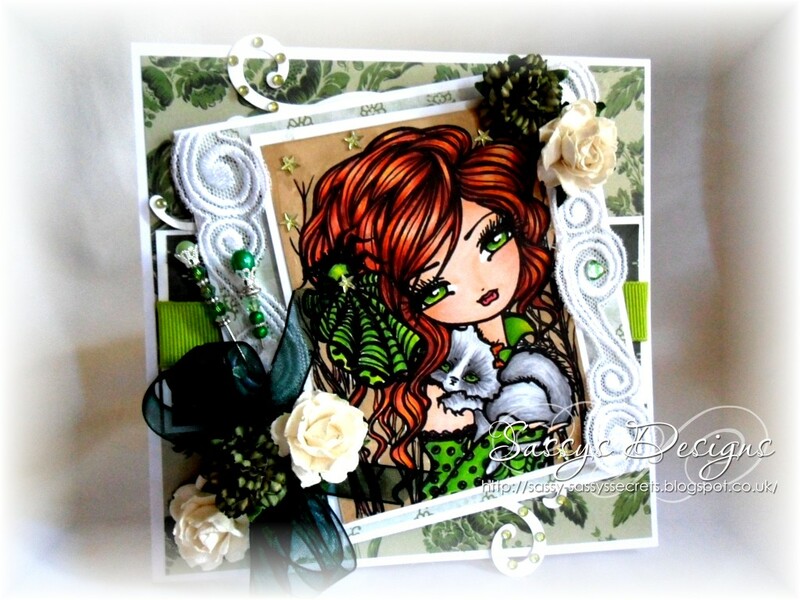 Stunning card Sassy gorgeous colour choices. wow Sassy this is stunning!! wish i could colour like that!!! Love her hair and those bright greens! Thanks for sharing this with us at the Simon Says Stamp challenge this week - good luck! aaaaaaw red hair and green eyes AND a cat! that's a card for me!!!!! wonderful wonderful wonderful, I luuuuv it! Pretty gorgeous. I love this.